This section covers package features as bandwidth, disk space, domains, subdomains, e-mail accounts, e-mail forwarders, mailing lists, autoresponders, MySql databases, domain pointers, FTP accounts, anonymous FTP accounts, CGI, SSL, SSH access, DNS control and Editing/ Deleting packages. 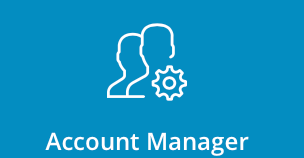 To list current packages and/or create new ones, sign into the control panel and then click on the "Account Manager" icon, followed by the "Manage User Packages" link. You will notice that there are no packages created on your account. 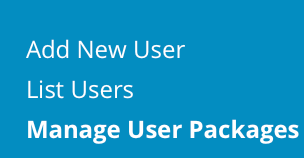 It is important to create at least one package now because User (customer) accounts need a package assigned to them. Click the "Add Package" link at the top of the screen. Remember to enter a name for your package and click the "Save" button. Note: Spaces are not permitted for the package Name. This is the amount of data transfer allowed in a one month period. Bandwidth is measured in megabytes by default, but you can choose different measure units from list. When a User exceeds his/her bandwidth, their site is suspended until the first day of the next month. This is the total storage space for the account, in megabytes. Domain files, MySQL databases, FTP accounts, etc., all contribute to total disk space. When a User exceeds his/her disk space, they will not be allowed to upload additional files until others are deleted. Each file and folder under a User account is an inode. Having a limit on inodes in DirectAdmin prevents a runaway User from having too many of them. This is the total number of domains a User can host on their account. If you select more than one, a User can add more domain names to their account and configure these domains through the control panel. The features from the main account (e.g. disk space and bandwidth) are shared among the additional domains. Users who create additional domains do not receive extra space, bandwidth, or other features. This is the total number of subdomains a User is allowed to have on their account. This is the number of POP3 mail accounts a User is allowed to have. This is the number of forwarding addresses a User is allowed to have. This is the number of Majordomo mailing lists a User is allowed to have. This is the number of autoresponder accounts a User allowed to have. This is the number of MySQL databases a User is allowed to have. MySQL databases count towards total disk space usage. This is the number of domains that can point to the User's main account. Domain pointers are different than additional domains because all the User can do is direct pointed-domain.com ---> main-account.com. The User cannot make a web site on the pointed domain. This is the number of FTP accounts a User can have. Even if you set this number to 0, the User will still have a default FTP account with full access to their site. This permits Users to allow anonymous logins to their FTP site(s). Users have the ability to disable anonymous upload while still allowing anonymous download. Anonymous FTP can present a risk to the User's site, and many Resellers choose not to enable anonymous FTP access. This permits Users to run CGI scripts. If this features is enabled, a /cgi-bin directory will be created in the User's public_html directory. This permits Users to run PHP scripts. SpamAssassin provides spam e-mail filter with customisable threshold. When The server receives e-mail to addresses that don't exist, it has to do something with those messages. Catch-All feature let user decide what to do with those emails. Many resellers tend not to choose to enable Catch-All e-mail, because abusing this setting can slow down server. This permits Users to install Secure Socket Layer (SSL) certificates on their site. This permits Users to access the server through SSH (an encrypted form of Telnet). Many Resellers and Admins disable this feature due to the potential for abuse (Users have full access to server content). Cron jobs are system commands that can be scheduled. Values that can be set are minute, hour, day, month, and day of week. System info shows all information about server CPUs, Memory and Services. Login keys allow you to create extra passwords for your account. These password have attributes, such as the ability to expire, usage limit, and can be limited to certain functions. This permits Users to alter their DNS records (e.g. A records, MX records, etc.). Many Resellers disable this feature because Users can disable their entire site by accidentally deleting or modifying domain records. Enabling this option will suspend user if he uses all his Bandwidth or Disk Space limit. Choose desired Skin from the selection box. We recommend using "Evolution" skin. That's it. Enter desired package name and press "Save" button. Remember, package name can't contain any special characters (including space). To delete one or more packages, place a check next to the package name(s) and click the "Delete" button. In the example below, the "Premium" and "Standart" packages would be deleted. Note: Deleting a package will not affect Users whose accounts are associated with that package. Their accounts will remain unchanged (with the same limits as before), except the package name will not appear in their account information screen. To edit a package, click on the package name (first column of the table). When you are finished, click the "Save" button.